Improve eye-hand coordination, muscle control, core strength and mobility with a rebounder trampoline from Current Therapeutics. Our medicine ball rebounders are adjustable and come with progressively weighted exercise balls, allowing you to customize the challenge. 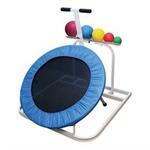 You can also use our rebounder trampolines in a level position for jogging and balance routines. For your convenience and safety, our most popular rebounders are equipped with built-in medicine ball storage racks and assist handles. Both our round and square rebounder options are built to endure rigorous daily clinical use. Looking for a rugged, “whisper quiet” rebounder design? Check out our heavy duty rebounder. When equipped with optional resistance cords, vertical leaper cords, waist belt and other optional accessories, this heavy duty rebounder can add a new dimension to your plyometric training program. Provide superior performance to increase upper body strength and endurance. 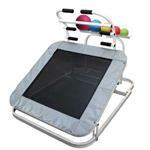 Order your rebounder from e-current.com today.